Detailed Description: Pass & Seymour 3-Gang Mounted blank wallplate in ivory color is made of thermoset plastic for enhanced durability. Standard-size wallplate is 0.460-Inch thick and provides a great way to conceal an unused electrical outlet for safety in residential/commercial areas. Wallplate is box mountable, comes with smooth finish and has vertical orientation. Wallplate that is molded of non-combustible mar-proof material is resistant to grease, oil, moisture, solvent and discoloration. Wallplate measures 6.375 Inch x 4.500 Inch x 0.460 Inch and has 3-blank configuration. 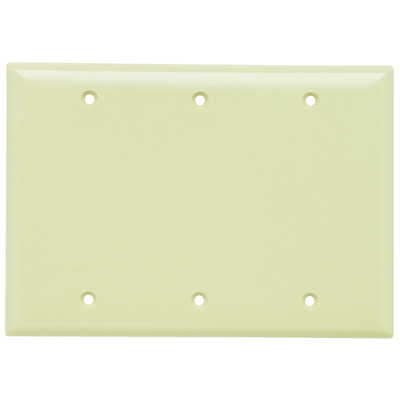 Wallplate is individually wrapped with color-matching screws for easy installation. Wallplate is CSA/UL listed and meets UL 514 standards.